It is imperative that you follow the manufacturer's specifications to insure the axle is installed correctly. Failure to follow the manufacture's procedures can result in failure of your new axle & hub bearing. One of the most common mistakes during installation is improper torque of the axle spindle nut. Over torque of the axle spindle nut can cause the bearing and axle to overheat , which will dramatically reduce the life of your new axle & hub bearing assembly. While it may appear to be easier to use an impact wrench , it is not recommended. A torque wrench is !!!!!!!!!!!!!!!!!!!!!!!!!!!!!!!!! Every vehicle has specific torque specifications , and it will be listed after the axle part number. New axle failure may also be caused buy broken or worn engine or transmission mounts. 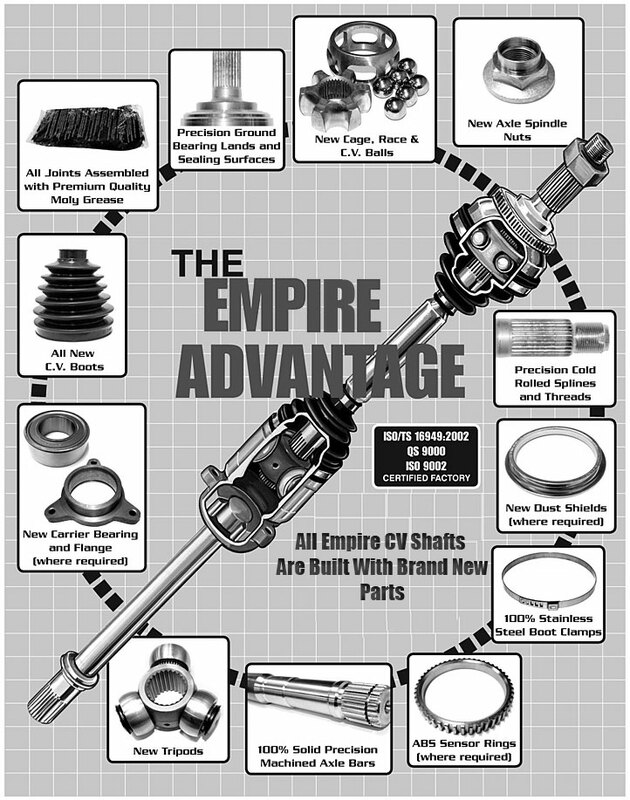 All of our CV shafts come brand new, this means there is no core charge to deal with. Also a LIFE TIME WARRANTY, this is an amazing deal. * High Quality. All of brand new Axles are backup up by QS9000/ISO9002 certified procedure and exceeding O.E. Standard. * No Hassle for Core Exchange. We offer brand new CV Axle help you eliminate the cost for core collection, stock, exchange and shipment. * Durability. All the components of brand new CV Axle are original equipment parts (not rebuilt). * Lifetime Warranty. We offer limited Lifetime Warranty on our brand new CV Axle. * Our NEW CV Axles are manufactured by GSP Group, the largest CV Axles manufacturer in China. * All of the added engineering and quality control we put into our products allow us to offer a limited lifetime warranty on all our CV Axles.